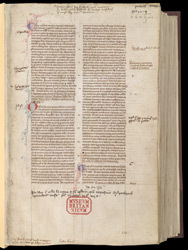 This manuscript, which contains a variety of texts by different authors, bears inscriptions stating that it was bought for Evesham Abbey by Richard Pembroke, who was abbot from 1460 to 1467. In the lower margin is an added inscription which states that this book belongs to the church of St. Mary and St. Egwin, Evesham, acquired by Richard Penbroch (Pembroke), a monk of the same church, for a price of 4 marks 6 shillings and 8 pence. (A mark was two-thirds of a pound, or 13 shillings and fourpence). 'Penbroch' and 'Evesham' are also inscribed in the top right corner of the page.